Skilled poker players should have no problems consistently winning at online poker rooms. In order to be a winning player you must choose the site you play at very carefully. Several sites are packed full of unskilled players which are referred to as fish. It is very easy to win money from these players. We are going to help you figure out how to spot a site that is packed with fish. We have already done a lot of research on the sites. All of the sites listed on this page are easy to beat poker sites. Whether you are a cash game player or a tournament player, you should have no problems winning at any of these sites. Which US Sites Are the Easiest to Beat & Have the Most Fish? So many online poker sites have pulled out of the US market. This makes it a little bit more difficult for US players to easily determine which sites are the easiest to beat. Some US facing poker sites are still have problems processing US deposits and withdrawals. These are not the sites that you want to play at. If it is difficult to get money into a site or out of a site, new players tend to get discouraged and choose not to play at that site. Throughout the years playing poker from the US, we've come to the conclusion that BetOnline is the easiest to beat poker site and has the best processing. This site has easy deposit methods, a casino attached, and it has 24/7 customer support. It has all of the things we are looking for in an easy to beat site. Why Are Some Sites Easier Than Others? There are a number of factors that contribute to some sites being easier than others. We are going to review some of the main factors below. This guide will help you to determine the easiest poker sites to beat. Don’t forget that we have already researched a almost all online poker sites, and the sites listed on this page are the absolute easiest sites to beat. 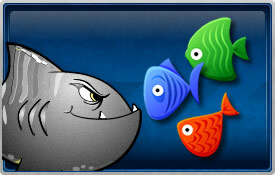 Casino Site Attached to Poker Site - Almost all online poker sites that have casinos attached will have tons of fish. This is due to the fact that the casino players spill over to the poker room. A lot of these players have rarely or never played poker before. These players are easy to spot because they play almost every hand, and they make huge bluff bets. Inevitably these players will win a few hands, and they will even win a few tournaments, but in the end these players will be losing players. You will win much more money from them than you will lose to them. Easy Deposit and Withdrawal Methods – Serious poker players have no problems finding a way to deposit and withdrawal money from sites. This is due to the fact that they have been playing poker for a while and have a network of buddies around the world that will deposit and withdraw for them. Banking is not a problem for players in some countries, but for players in the US it can be a huge problem. Most sites that jump through hoops to make sure that players have easy banking methods are seeking new, unskilled players. These sites will have tons of fish which make them easy to beat. They also allow players to make smaller deposits, including payments as low as $20. Easy Accessible Customer Support – The easiest sites to beat almost always have customer support available 24/7. Many new players find it difficult to choose which deposit method to use. Customer support is available via phone, email, or live chat to quickly help these players decide which method is best for them. The support team is always ready to assist players with depositing funds. This makes new players feel comfortable with the room, and it attracts a lot of new, unskilled players.